Heat 2 teaspoons of oil over med-high heat and brown the pork and beef for 4-5 minutes, sprinkling with salt & pepper. Remove to a bowl. In the same pot in 1 teaspoon of oil, brown the onions & garlic for 2-3 minutes until golden brown. Add mushrooms, cook & stir 2 minutes. Add cabbage, cook & stir 2 minutes. Stir tomato paste into chicken stock and add to the pot along with the remaining ingredients. Combine well, burying the meats under the mixture. Cover and simmer 2 hours, stirring occasionally. Remove the pork and beef and shred using 2 forks. Return to pot. 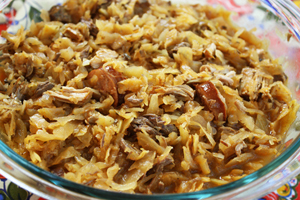 28 Comments on "Polish Hunter’s Stew (Bigos)"
My grand mother made an Easter Soup that was to die for. Over the years, recipe was lost. It had kielbasa, dried mushrooms, potatoes, a little vinegar, eggs, maybe sour cream and other stuff. I was in elementary school at the time and still remember the way it tasted. Any thoughts on a complete recipe? Look up recipes for Zurek soup, many variations but with ingredients you’ve listed it may be it. Could it be kluski? See my Potato Gnocchi recipe. I make this and enjoyed it very much. Next time I’ll only use 1/2 of the kraut juice as it was a little strong for me. Also, be sure and use a good quality sausage or it won’t add much taste to the bigos. I think I’ll also add a cup of sliced carrots. I served it with garlic mashed potatoes. Very good. Hi Jenny, Have you ever made saurkraut from scratch? I would like to try this and I trust your recipes! I think it would be especially great for bigos. 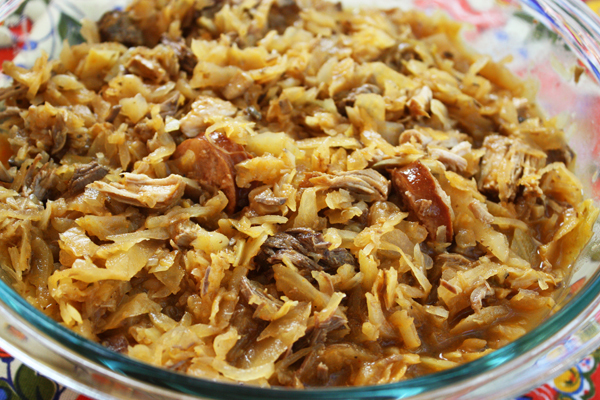 I make my own Kraut and use it for Bigos. It turns out wonderful! They are hard to find in less you have a Polish import store but, try and find the dried Polish mushrooms for this dish it’s worth the effort and the huge expense, about five bucks an ounce ! Cyndi, I use a lot of dried mushrooms and buy them directly from Kirsch Mushroom Company in New York. 718.991.4977. They send me a pound of wonderfully tasty i perfectly fragrant dried mushrooms for about $65. Believe me, you will like them. Ps. I made your crusty rolls (subbed 1 cup of whole wheat and added 1 tsp of vital wheat gluten – they turned out great ! Your recipe is not really clear on when & what to do with the sauerkraut and reserved juice???? Drain the kraut and in step #5, add all of the drained kraut to the pot. Of the reserved juice you save when draining, add one cup of the reserved kraut juice to the pot. I hope that helps. Can this be done in a slow cooker/crockpot? I’m sorry I have no experience with slow cookers. Yes it can be made in a crock pot. Just cook it on low for about 6-8 hours. My wife is from Cracow Poland and she introduced me to this 20 years ago. This is a main staple in our house. Can this be pressure canned? It would be nice to make up a bunch of this and can it so we could have a jar ready any time we want. Sorry, I have no experience with canning. Have just discovered your recipes as I was searching for Polish foods my Babcia used to make for Easter and Christmas. Did not know you were of Polish descent so is another plus in my book! I really want to try the punchki and chruschiki tha t I loved as a kid. Thanks. Hope to pass on these traditional foods to my daughter so it isn’t lost. Is the Kielbasa smoked or raw? Is there a substitute for the sauerkraut juice. Not sure where to get the sauerkraut juice. Do you have any suggestions as the recipe sounds good. The sauerkraut juice will be in the container of sauerkraut so you keep it when you drain the kraut. I will clarify the recipe so I’m glad you asked. I haven’t tried this yet, but will, this Fall. Being Polish I love this dish and know that yours will be as good as I remember. I’ll update after we make it. Can’t wait to try this. Was wondering though, can it be braised in the oven at step 5? If so, what temperature would you suggest? and would it need to be covered? Also, is the centre cut pork cut up into smaller pieces? It needs to be covered for the two hours it cooks and the best temperature if you cook in the oven would be 325, but you should check on it and stir about every 30 minutes. When the stew has finished cooking, the pork is shredded using two forks and returned to the pot. Jenny, I love your recipes! Your beef stew is the best, my teenage daughter requested it for the first day of Fall so I made it last night. My mom said it was the “best stew she’s had in decades”. Love your site, thanks for sharing your family recipes with us.